Heat the oven to 180 ℃. Oil round form with split edges. For basis: Fry coconut in pan over medium heat, constantly stirring. When coconut browns a bit add nuts and dry a little. Add pieces of butter, stir till it`s dilution, remove from heat and shift coconut mixture in form, press to the bottom. Put form in freezer. Fry coconut for bizet, cool it. For filling: Mix cream-cheese with sugar at medium speed for 3 min. Add eggs one by one, mixing well after each, from time to time stopping mixer and cleaning walls of bowl (do not mix curd mass after adding of eggs long, not to fill it with air). Add lemon juice, vanilla and almond essence, stir it. Pour filling on cold basis. Bake for 35 min in form 23-сm or 40 min in form 20-сm (edges of cheesecake start to bake and rise a bit, but pie is not ready yet). Take cheesecake out from oven. For bizet: Mix white with vanilla essence into soft peaks, gradually add sugar and mix into tight peaks. Mix bizet with coconut. Carefully spread bizet with spoon on cheesecake, by small portions, trying not to press on stuffing, spread over the surface. Bake for 15-20 min till bizet drying. Remove from oven and cool on grid for 15 min. 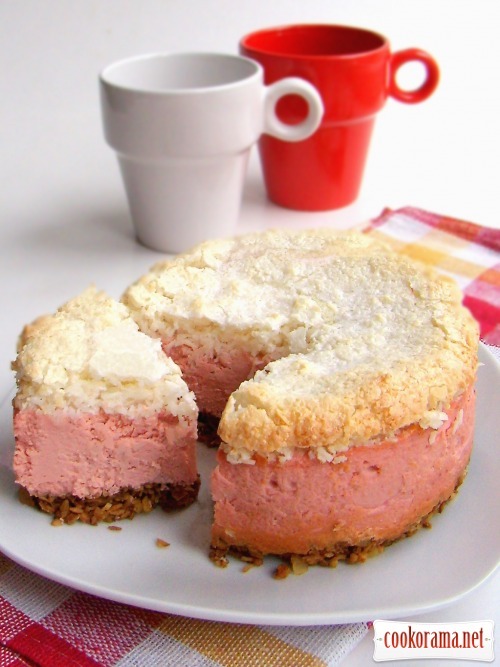 Top of recipe "CHEESECAKE WITH COCONUT MERINGUE"
Красиво. А чого чізкейк рожевий? Очень аппетитно! Мариша, а как вы добились такого красивого розового цвета? Девочки, в конце рецепта написано, я добавила черничный сок.